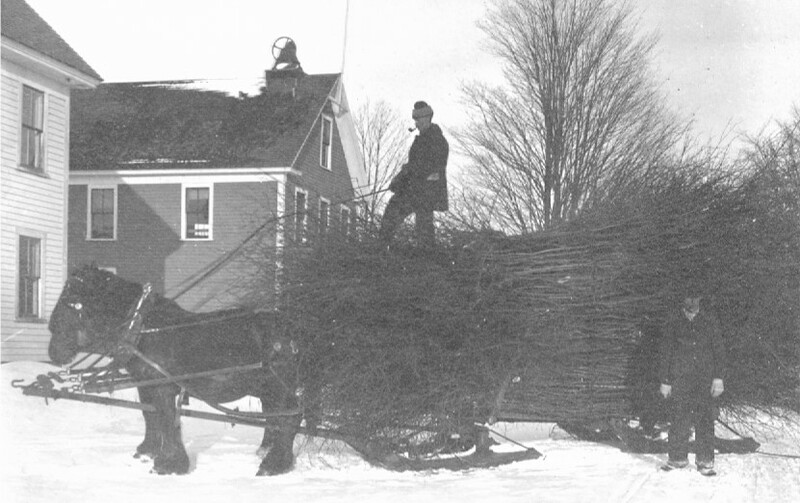 Clarence and Ernest Harrington delivering witch hazel to the Gould Witch Hazel Distillery on the turnpike in Windham. “A number of witch-hazel bushes bearing fresh blossoms were noticed December 1.” The distilling of witch-hazel was once a large business in New England. Both Gould and Merrimack witch hazel companies operated mills on Rockingham Road (the turnpike) and on Golden Brook Road. Carefully selected green twigs were boiled in large vats and the mixed with alcohol. This time of year, you can still see witch hazel blossoming in Windham. One of the easiest places to spot it is on the walking trail at Griffin Park. There are several bushes blossoming in the wooded buffer between the park and Johnson’s farm. Witch Hazel blossoming in Griffin Park, December 6, 2016.